In 2004, my family loaded up our 1991 Honda Accord station wagon and traveled west to Colorado. Since I am adventurous by nature, I did not want to travel on busy freeways and highways. My wife and I chose US Highway 50 duly noted as the Loneliest Road in America. It’s quiet because there are no major attractions on the way except the magnificent beauty of the endless mountain ranges that cover the state of Nevada. However, it’s far from lonely when start noticing other people traveling through the state to see how lonely it is. I have seen bicyclist, RVs, motorcycles, and an occasional bicycle making the wonderful trek through Nevada. You may think that Nevada is one big waste land of dry desert. It probably has more mountain ranges than any other state in Lower 50. The Loneliest Road in America cuts through at least a dozen mountain ranges and offers panoramic views across the entire state. It even boasts Great Basin National Park at the East end of the state that is a rare treasure worth visiting. Why Drive The Loneliest Road In America? Our first stop for a break is usually in the city of Fallon for a quick breakfast or lunch. Fallon has a good sized Walmart for you to purchase camping gear and fill the cooler with ice and last minute food items. You will not find a decent size grocery store until you arrive at Ely. It has a nice city park with a playground. My boys still love running around in city parks. Another favorite place to stop and gawk is Sand Mountain. Out in the middle of no where are these giant sand dunes that people ride motorcycles, atvs, and 4x4s. The kids love it! I find it so fascinating to visit historical towns that are not tourist traps. The the few towns that you drive through are real operating western towns that make you feel as if you are traveling backwards in time. Austin is one of these wonderful places worth stopping at. There is a nice city park located on the west end of the town that has a swimming pool and picnic table to eat at. We have never been able to use the swimming pool as we usually arrive on Sunday. I have never seen a no camping sign in the city park. It would not hurt to ask. The small town of Austin is where we usually make our first official night for camping at Bob Scott campground. When you first arrive to Austin, it has an almost ghost town like feel for it. 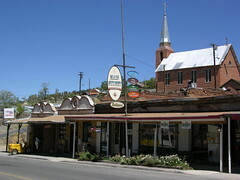 There is an old hotel that has an operational bar, an Episcopal church, a Catholic church, and a Methodist church. The town is almost built on a cliff or at least the side of a mountain. There is nothing level in the entire city. If you rolled a ball from the east end of main street to the west end, it would roll very fast. However, main street it too windy to even attempt this. The fun does not stop at Austin. There is still Eureka, Ely, Garnet Hill, and Great Basin National Park to visit. On 2 separate occasions, my wife requested to spend a day digging for garnets at Garnet Hill. Even though the day time temperatures were always hot, it was always worth our time to find garnets. If you are a rock hound, this is the place to go. The infamous shoe tree is another favorite break for us. Some one had a great idea and threw a shoe up in an old tree. Other people copied the idea and now there are hundreds of old shoes hanging from the tree.